Description: Change Mac Address in seconds! Scan Remote Mac Address. Exports the scanning results from a Mac Address Lookup list. Spoofing the Mac Address of your network card to any new Mac Address. Bind MAC/IP. Wake on Lan. Win Ipconfig.Port Scan. Scan any range of IP for the proper Mac Address. Support changing Mac Address of any network cards under Windows NT/2000/XP/95/98/2003. Support exporting scanning mac address results to txt or csv file. Description: Scrape websites and extract data into customizable CSV files ready to be imported anywhere like web databases and office tools. Mix and mash scraped website data to create new mashup website services such as weather, travel and hotel portals. The crawler engine is highly configurable with regards to which URLs to scrape data from. You can also control the speed of crawling to fit your needs. Description: The A1 Website Search Engine tool can create site search solutions. Adding this to your website will help visitors find what they are searching for on your website. This is in particular useful if the website visitor entered your website through a page not containing what they needed. This will help increase conversions if you sell goods or services and improve overall website functionality. Description: Acer Laptop to Hotspot Converter converts your Acer laptop to a wireless hotspot. By this software, your Acer laptop (Windows platform) is turned into a Wi-Fi hotspot so that you can share the Internet with your second laptop or mobile devices. Of course you do not want to carry a wireless router while on the trip. But you have to find a Wi-Fi hotspot for your mobile. 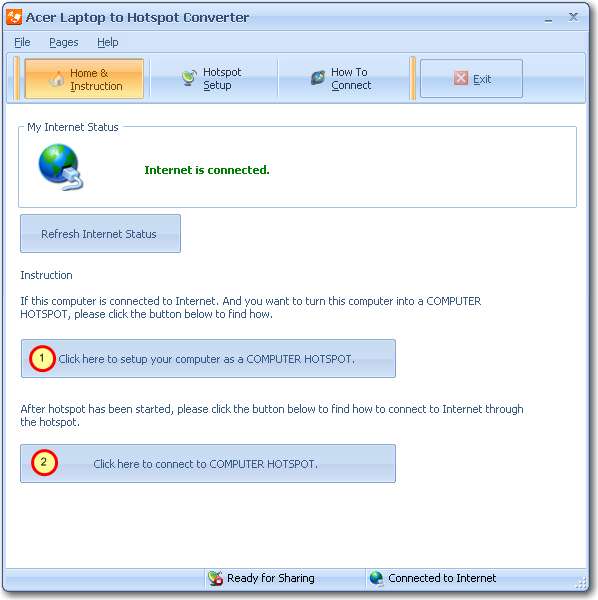 Laptop to Hotspot Converter Series software make your life easier. Description: AirShou is a high quality Screen recording application which is compatible with iOS firmwares.This amazing third party screen recording application will let you to record your screen during any time which you would like to record your device.This application will support with all iOS running smart devices such as iPhone,iPad,iPod Touch running devices.This application will be provided you all access to your high quality video.Make it easy. Description: Network Administrators use this tool to inventory computers in the corporate networks for the software and hardware configuration, generate software licenses reports, etc. The program does not require the client module to be installed on each individual workstation, but can be configured to inventory all network computers by only copying the files to a single shared folder on a file server. Description: System management tool that allows Network Administrators to execute programs on remote network computers without leaving their workplace. This can be useful in the case of the operating system patch installation, execution of the diagnostic tools, etc. The person using this software to execute programs on remote computers should have administrative login and password for the computer(s) he/she is remotely launching the programs on.